Apart from RUI enhancements, we carried out following enhancements in C4C Analytics in 1702. For details on RUI Analytics enhancements please click here. You can now download C4C report in a PDF as well as xlsx file. The difference between xlsx and Spreadsheet download is that Spreadsheet is in XML format and is heavy while xlsx file is light. Thus when you are looking for formatted file with less volume of data you should use download as Spreadsheet, however when you are downloading large volume of data you should download it as xlsx file. C4C now allows you to transfer deleted records to BW using ODP integration. This will be useful in case when you extract C4C data to BW and also allow deletion of objects in C4C. Earlier to keep the two systems in sync you were required to carry out a full load. But now you can extract delta from regular data source (using pseudo delta) and can transfer deleted records information from Deleted Data Data Source. This is a common Data Source that will capture the information for all the objects that are being transferred to BW. Note: The log of deleted records get cleared after 45 days. Thus anything deleted more than 45 days back will not be available in the delete data source. New relative select for ‘Next 180 days’ is added. This calculate the next 180 days from the date of execution. I have 2 doubts in this regards. The first scenerio where in we are facing issue with regards to the integration between BW system is as below. 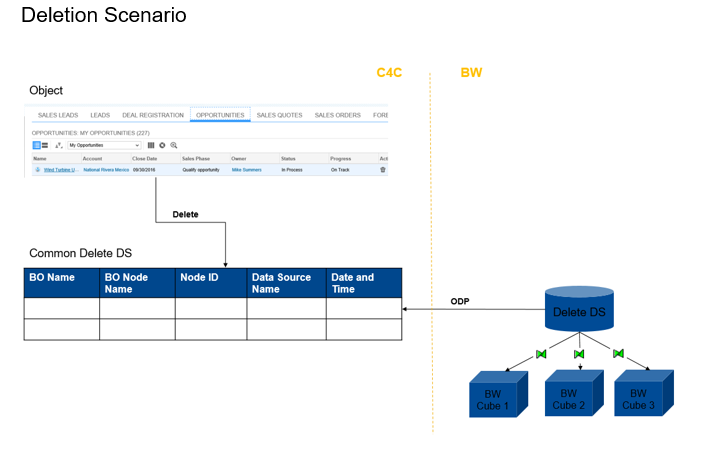 We have connected SAP BW system 7.4 with SAP C4C system 1702 (Cloud for Customer) using ODP connection. When the data for the datasource is previewed in C4C system the data is being properly displayed. But when the data is extracted in BW system and the datasource is previewed instead of the data the UUID is displayed. Eg. In case datasource CODOPPH – we require Opportunity name (DOC_UUID) and Opportunity ID (DOC_ID) the fields are displayed correctly i.e we are able to view the Opportunity name and Opportunity ID at the C4C end. But in case of BW UUID is displayed for Opportunity name and opportunity id is displayed correctly. In case delta load as you have mentioned in the blog above “extract delta from regular data source (using pseudo delta) and can transfer deleted records information from Deleted Data Data Source.” We are unable to find any setting in the BW system via which we can do delta loading.